For all of those diehard readers of my blog (Dad), you might wonder why I didn’t post on Monday. I have a good reason: I was waiting for my latest essay to appear on Bustle. The essay chronicles my year following the social (and social media) challenge #ReadWomen2014 and some of my big takeaways from my year reading women, including the ultimate lesson learned: that diversifying my reading habits is more than expanding gender horizons. Bookmarks created by Joanna Walsh, who created #ReadWomen2014 and inspired me to change my reading habits. I spent the year reading short stories by Karen Russell, Cristina Moracho’s young adult novel about how friendships change as we grow up, Julia Lovell’s non-fiction account of the Opium Wars fought between the English and Chinese, a noir anthology that featured Roxane Gay and Lindsay Hunter, and poetry by Mary Oliver, amongst many other books. When I started this challenge, I wrote about it on my blog. 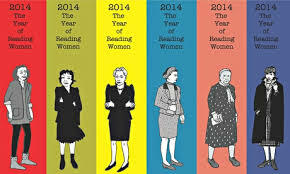 It was a little bit of self-congratulatory back-patting mixed with excitement over a year of reading women. I felt great jump-starting a conversation with others about the challenge, until a commenter quickly pointed out how limited my reading had been in terms of race and culture. Nearly all the female authors I listed that I had either already read or planned to read in 2014 were white American or British authors. It amazed me how self-righteous I could act because I had chosen one form of protest. I’ll leave you to my Bustle essay to read the rest of my thoughts on #ReadWomen2014 and book diversity. For anyone out there looking to join the conversation, I recommend looking into #WeNeedDiverseBooks, which aims to make children’s publishing more diverse. Next Post How Many Licks Does it Take to Get to the Center of This Story?